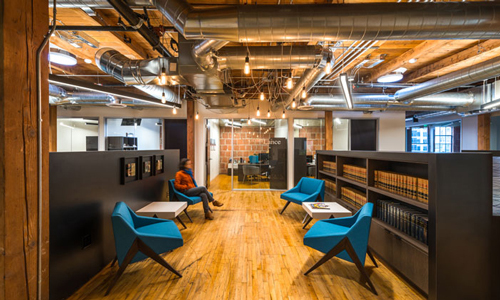 NoonanLance’s new office on the top floor of the historic Pack Lofts building in Downtown San Diego’s East Village is truly one-of-a-kind, and arguably the most unique law office we’ve ever seen! The space is what I’d call “industrial chic,” with open ceilings, exposed block walls, and original hardwood flooring. From the moment you step out of the elevator (they have the entire fourth floor to themselves where the elevator opens up directly into their lobby), you are immediately welcomed by the richest of textures, colors and tones and surrounded by a feeling of warmth, sophistication and comfort.